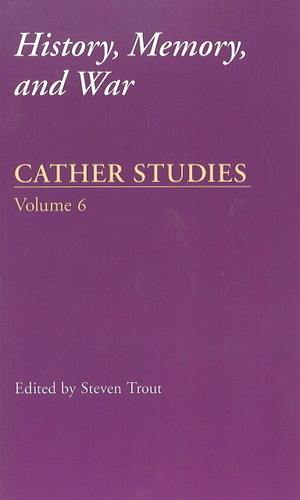 Cather Studies 6 is part of a growing body of scholarship that seeks to undo Willa Cather's longstanding reputation as a writer who remained aloof from the cultural issues of her day. This chronologically arranged collection demonstrates that Cather found the subject of war both unavoidable, because of her position in history, and artistically irresistible. The volume begins with an essay addressing the American Civil War as part of Cather's southern cultural inheritance and concludes with an account of the aging writer's participation in the Armed Services Editions Program of World War II. Military matters surface not only in One of Ours and The Professor's House, Cather's two major contributions to the literature of World War I, but in most of her other works as well, including My Antonia, in which the Plains Indian Wars and the Spanish-American conflict of 1898 are subtly but significantly evoked, and Sapphira and the Slave Girl, Cather's largely ironic contribution to the genre of southern "Lost Cause" fiction. Containing essays by leading Cather scholars, such as Ann Romines and Janis Stout, and work by specialists in war literature, whose inclusion expands the number and range of critical perspectives, this volume breaks new ground. Steven Trout is a professor of English at Fort Hays State University. He is the author of Memorial Fictions: Willa Cather and the First World War (Nebraska 2002) and the coeditor of The Literature of the Great War Reconsidered: Beyond Modern Memory. Contributors include Mary Chinery, Debra Rae Cohen, Michael Gorman, Jennifer Haytock, Pearl James, Celia M. Kingsbury, Susan Meyer, Margaret Anne O'Connor, Wendy K. Perriman, Mark A. Robison, Ann Romines, Mary R. Ryder, Janis P. Stout, and Steven Trout.